It is essential that safety signage is adequately positioned around building sites to ensure that building site personnel are warned of risks that may be present on the site and also what precautions they need to take. At The Safety Centre we have a selection of Building Site Safety Signs manufactured by Jalite which are suitable for use on UK building sites. 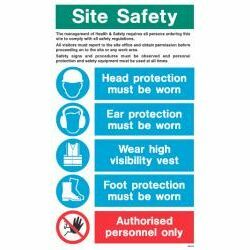 For more information on Building Site Safety Signs call us NOW on 01200 428 410. In addition to the Jalite Building Site Safety Sign range we also have a wide variety of signage suitable for use in all buildings in the UK. Many of the signs in this range are manufactured in a photoluminescent material which is designed to glow in the dark in the event of a lighting failure. This ensures that the safety signs are still visible in pitch black conditions. The Jalite range of building site safety signs are made from a robust rigid white pvc material. These signs are available in large versions which are designed to be positioned at the entrance of the building site to instruct people of the dangers and rules on the site. It is imperitive that there is adequate signage on building sites to ensure that the HSE rules are adhered to. Should you need any more information on these signs call us NOW on 01200 428 410. If you’re interested in these products you may also be interested in our Fire Extinguisher ID Sign range and Emergency Exit Sign ranges.